Last Saturday, women’s track and field went to Indiana University of Pennsylvania to compete in the Ed Fry Invitational. The other competing teams were Indiana University of Pennsylvania, California University of Pennsylvania, Grove City College, Slippery Rock University, Clarion University, Pennsylvania State University, Penn State Behrend, and Seton Hill University. Junior Tori Baggio scored her career best in the high jump, placing eighth after clearing 1.43 meters. In the discus event, junior Sarah Menio threw 32.02 meters and sophomore Samantha Oleson threw 26.22 meters, placing fifth and ninth, respectively. Oleson also placed eighth in the hammer throw with 37.18 meters. Sophomore Kelsey Hallinen finished eighth in the 400-meter hurdles, scoring a time of 1:11.68. On April 14, the women’s team competed in the Dave Labor Invitational hosted by Slippery Rock. First-year Sasha Spalding recorded a season-best 200-meter race time of 26.67 seconds, which placed her second. Senior Ivana Moses went for a season-best 13.17 seconds in the 100-meter dash for third place. Moses also competed in the long jump, placing second with a distance of 4.77 meters. First-year Stephanie Chen long jumped 4.62 meters to finish in third place. Named the University Athletic Assocation Athlete of the Week for the third time this season, sophomore Jacqueline Guevel won the 400-meter hurdles with a time of 1:03.61. Guevel finished second in the 100-meter hurdles with a time of 14.50. 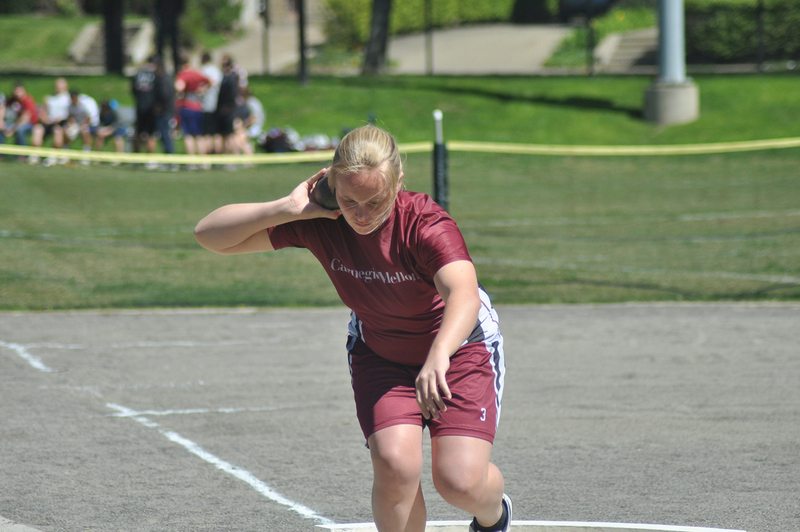 Oleson threw 39.67 meters in the hammer throw for a personal best, placing fourth. Carnegie Mellon hosts the University Athletic Association Championships this Saturday and Sunday at Gesling Stadium. The event will start at 10 a.m.